The concept of orthomolecular medicine was Pauling’s grand theory of human health. His approach was chemical, and viewed the body as a vast laboratory buzzing with chemical reactions: enzyme-substrate reactions, energy-producing reactions, antibody-antigen reactions, the chemical interactions that resulted in genetic duplication, and electrochemical reactions in the brain and nerves. Health, in this view, resulted when the lab was well-run and reactions were moving ahead properly; disease resulted if the proper reactions were hindered or stopped. Optimal health could be achieved by perfecting reaction conditions and making sure that the body maintained the proper balance of chemicals (nutrients, catalysts, and products). He first used the term in print in 1967 in relation to psychiatric therapy. He had by then become convinced that conditions such as schizophrenia could be treated with nutrients such as niacin (an approach developed by Abram Hoffer and Humphrey Osmond). However, his theory of orthomolecular psychiatry was either ignored or criticized by the medical community. 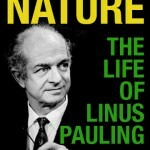 In March 1966, in a speech Pauling gave after receiving the Carl Neuberg Medal – awarded for his work in integrating new medical and biological knowledge – he men­tioned to the audience that he wanted to live another fifteen or twenty years in order to see the wonderful new medical advances that would surely come. 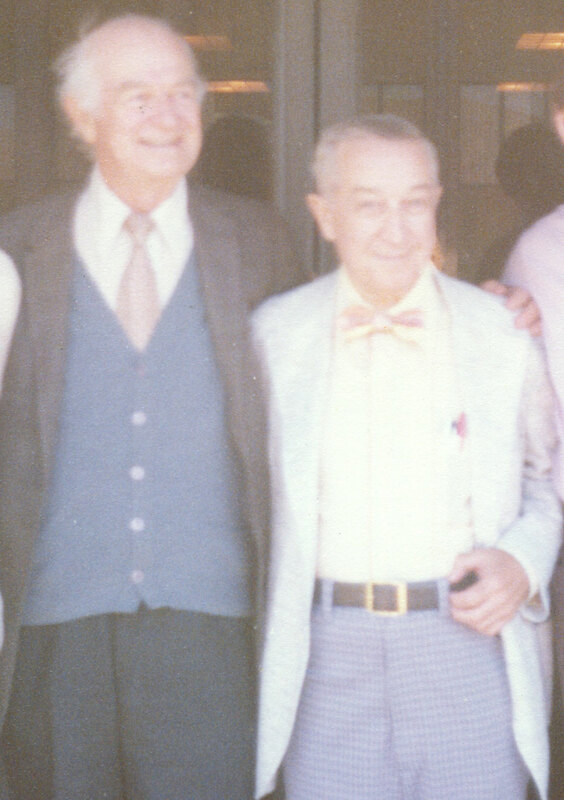 A few days later, he received a letter from Irwin Stone, a gregarious Staten Island biochemist he had met briefly at the Neuberg dinner. Stone told him how much he appreciated his talk and then wrote that asking for twenty more years of life was asking for too little. Why not live another fifty years? It was possible, if Pauling listened to his ad­vice. 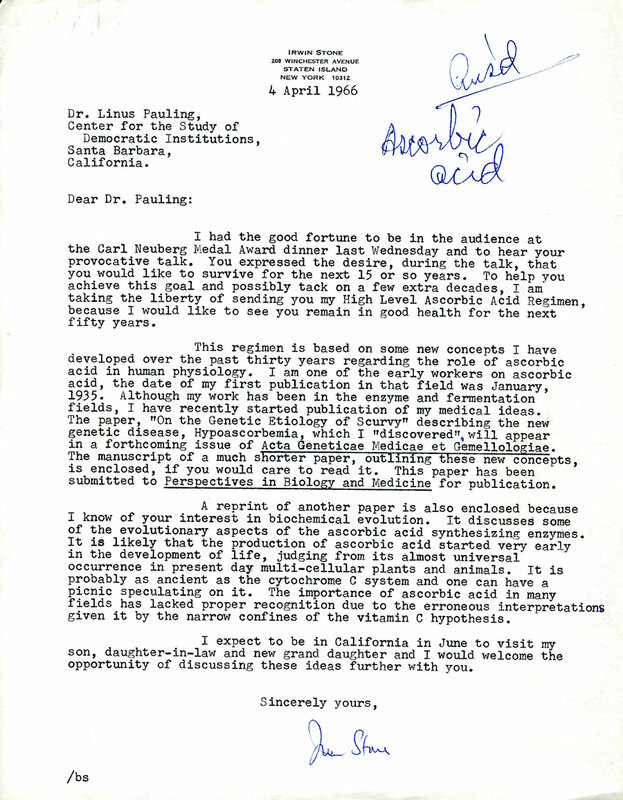 Letter from Irwin Stone to Linus Pauling, April 4, 1966. This is the communication that spurred Pauling's interest in vitamin C.
He then told him about vitamin C.
Irwin Stone had been interested in vitamin C since 1935, when he began publishing papers and taking out patents on the use of ascorbic acid, or ascorbate (both synonyms for vitamin C), as a food preserva­tive. Over the years his interest grew as he read a series of scattered re­ports from around the world indicating that ascorbate in large doses might have some effect on treating a variety of viral diseases as well as heart disease and cancer. Convinced of its health-giving power, Stone and his wife started taking up to 3 grams of the vitamin per day- many times the daily dose recommended by the government. Stone felt better as a result, but it took a car crash to make him a true believer. In 1960 Stone and his wife, driving in South Dakota, both nearly died when they were hit head-on by a drunk driver. They not only survived the crash, however, Stone told Pauling, but healed with miraculous rapidity. This he attributed to the massive doses of vitamin C they took while in recovery. He emerged from the hospital ready to convince others about the value of ascorbate. He began to read widely, noting that among mam­mals, only man, closely related primates, and guinea pigs were unable to synthesize their own vitamin C internally because they lacked an en­zyme critical in producing the vitamin. As a result, humans had to ob­tain it through their diet. If there was none available, the result was scurvy, the dreaded ailment that had killed thousands of sailors before a British physician discovered it could be prevented by providing lime juice or fresh oranges. The U.S. government had duly set the mini­mum daily requirement for vitamin C at a level just sufficient to pre­vent scurvy. This genetic-disease concept provides the necessary rationale for the use of large doses of ascorbic acid in diseases other than scurvy and opens wide areas of clinical research, previously inadequately explored, for the therapeutic use of high levels of ascorbic acid in infectious diseases, collagen diseases, cardiovascular conditions, cancer and the aging process. In other words, to Stone, giving someone enough vitamin C to pre­vent scurvy was like feeding them just enough to keep them from starv­ing. Full, robust health demanded more. He advised that Pauling start with about one and a half grams per day. It was especially good, Stone said, for preventing viral diseases like colds. “I didn’t believe it,” Pauling later said jokingly of Stone’s letter. After all, Stone was no physician, nor was he a nutritionist exactly or a professional medical researcher. 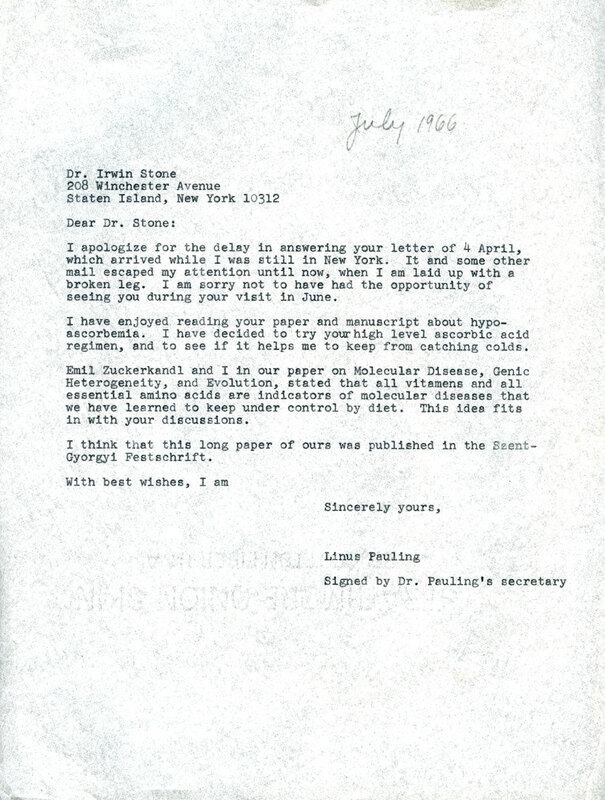 Pauling's response to Stone's letter of April 4, 1966. Written in July 1966. But Pauling was interested enough to try taking more vitamin C himself. He discovered that it helped him fight off the colds that had frequently afflicted him. He felt better. He took a little more. Then more. But he told few people about it. He remained generally silent about ascorbic acid and its benefits through the late 1960s, limiting his few comments to ideas about how it might be used, along with other nutrients, in the treatment of schizo­phrenics. In late 1969, however, convinced by the theoretical argu­ments of Irwin Stone and impressed by his own success in preventing colds, Pauling began expanding his comments to include the subject of ascorbate and general health, noting in a speech he gave to physi­cians at the Mt. Sinai Medical School his success with the use of vita­min C as a cold preventive. His comments were reported in the newspapers. 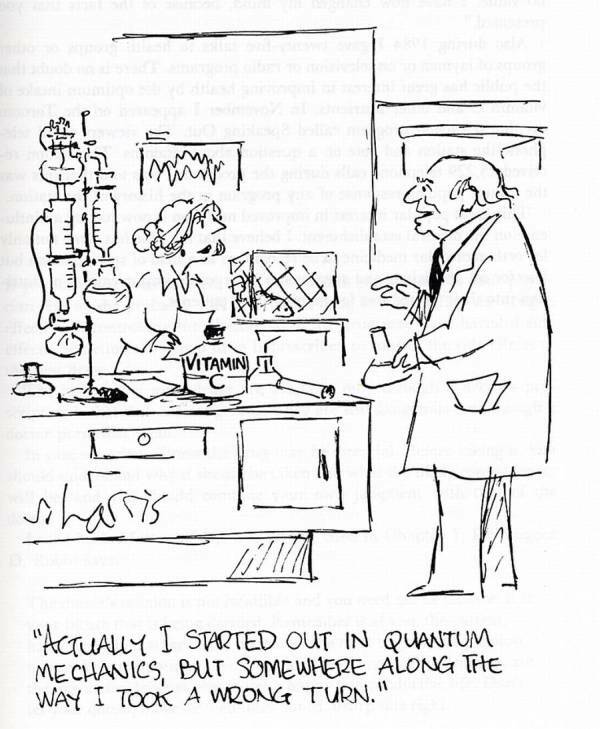 Cartoon of Linus Pauling in the laboratory, by Sidney Harris. 1985. That is how it began. Then, two things happened. First, he received a “very strongly worded” letter from Dr. Victor Herbert, a leading clinical nutritionist and a man who helped set the U.S. recommended daily allowances (RDAs) for vita­mins, who assailed Pauling for giving aid and comfort to the quacks who were bleeding the American public with unsupported claims about the benefits of vitamins. Where, Herbert asked, were the care­fully controlled clinical studies to prove that ascorbic acid had a real effect on colds? Pauling was taken aback. He had not, in fact, carefully reviewed the literature on vitamin C, limiting his reading to a few of the cita­tions in Irwin Stone’s original papers. But now, “sufficiently irritated by this fellow Herbert,” he began a typically comprehensive tour of the scientific journals. Second, a writer for Mademoiselle magazine contacted Pauling to get his comments on vitamin C for an article on its health benefits. Pauling offered the reporter the general observation that “optimal amounts of vitamin C will increase health and intelligence” and re­ferred readers to his paper on orthomolecular psychiatry. When the article appeared in November 1969, he found his statement rebutted by Frederick Stare, a professor of nutrition at Harvard, who said Paul­ing “is not an authority on nutrition” and that there was no evidence that increased C helped prevent the common cold; in fact, just the op­posite was true. A large-scale study done with five thousand students in Minnesota twenty years earlier, Stare said, had proven definitively that vitamin C had no effect on colds. Stung, Pauling quickly tracked down the study and decided that Stare had gotten his facts wrong. The 1942 University of Minnesota study involved 363 student subjects who had been given either a placebo or some extra ascorbic acid over a period of twenty-eight weeks. It was true that the authors had concluded in their summary that there was no “important effect” of vitamin C on infec­tions of the upper respiratory tract. But when Pauling took a closer look at their data, he decided they were wrong. Despite what Pauling considered the very low dose of vitamin C given the students – an aver­age of 180 mg per day compared to the 3,000 mg Pauling was now tak­ing – the researchers had in fact seen an effect: Subjects receiving the extra vitamin had 15 percent fewer colds, and the colds they got were 30 percent less severe than those receiving the placebo. Vitamin C was not a preventive or cure, but the results were, Pauling estimated, statis­tically significant. It was confusing, especially when Pauling saw the same thing hap­pening in other reports he found on vitamin C and colds: Partial ef­fects were discounted. The physicians who ran the studies seemed to be looking for total cures, not an indication of an effect. The doses they used were low (150-250 mg was common in these early studies – several times the current RDA but many times lower than what Pauling and Stone considered a protective dose), and the effects they looked for were too strong. The problem, Pauling decided, was that the researchers were look­ing for vitamin C to act like a drug. In traditional drug testing, small differences in dosage could have tremendous effects, and overdoses were deadly. The tendency was to use relatively small amounts and look for big effects. 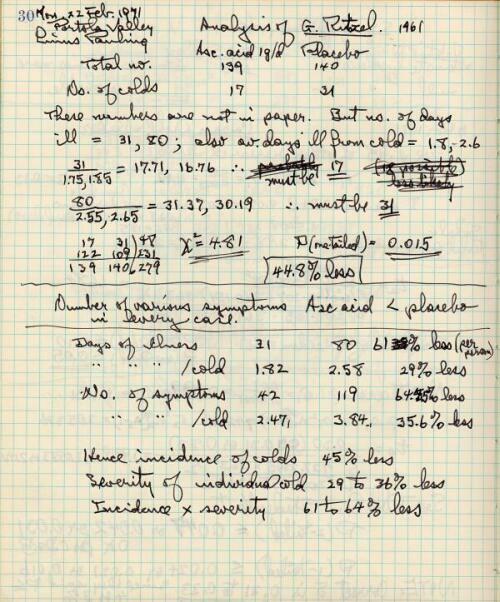 Pauling research notebook entry on Gunther Ritzel's 1961 study. Notes dated February 22, 1971. But to Pauling, vitamin C was a nutrient, not a drug. When the medical researchers saw a small effect, he thought the logical next step should have been to follow up with larger doses. His literature search uncovered at least one study that showed what might happen if they did. In 1961 a Swiss researcher named Gunther Ritzel had given half of a group of 279 skiers 1,000 mg per day of vitamin C – more than five times the Minnesota dose – and the other half a placebo. Ritzel found that those skiers receiving ascorbic acid had 61 percent fewer days of illness from upper respiratory tract infections and a 65 percent decrease in the severity of their symptoms compared to the placebo group. This, Pauling thought, was very strong evidence in favor of his ideas. Plot the dose of vitamin C along the bottom of a graph and the effects on colds up the side and you could draw a straight line from the Minnesota results (a small effect with small dose) to the Swiss findings (a larger effect with larger dose). He found a few other papers in which the results fit the pattern. True, some of the research he looked at showed no effect at all – most of these studies, Pauling estimated, were flawed because they used too low doses, too short duration, shoddy oversight, or improper blinding – but the important thing was that a small group of careful clinical studies existed that supported Pauling and Stone’s general theory of vitamin C and health: The more C you took, approaching megadose levels, the lower your chances of getting sick, and the less sick you got.